This elegant Mid-Century Modern cocktail table attributed to the esteemed Mid-Century Modern designer Milo Baughman, circa 1970. It features a volumetric rectangular top in bookmatched and burled Carpathian elm with an ebonized walnut base in the same form. A smoked and beveled amber glass layer adorns the top protecting the wood beneath, and offering a beautiful aesthetic compliment to the piece. With its austere form and clean modernist lines, this cocktail table is as versatile as it is beautiful, blending perfectly with any style of interior from Classic Mid-Century Modern to contemporary. Mint restored condition. 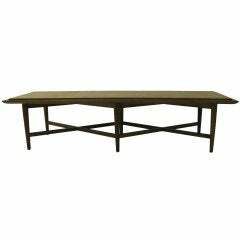 American, circa 1970 Dimensions: 60" W x 24" D x 13.5" H.
Large swedish Art Deco coffee table in Carpathian elm and ebonized birch. Visually stunning with an elaborate top, and thick brass base.